Last week the hellebore has been blooming gloriously in the misty unusually warm New England weather. Today the sun broke out. I saw my bees were out foraging. Hard to believe on the last week of the year! 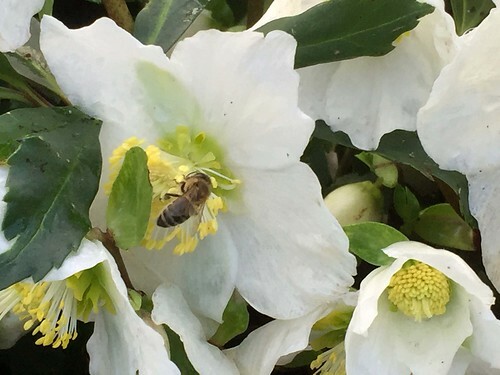 I found some, collecting hellebore nectar. The hive entrance was pretty active with three or 4 bees passing in and out at any one time. I didn't see any bees foraging around the pond on our afternoon boat ride. Of course - there are no flowers there. The only flowers around now are some dried dianthus and some beautiful hellebore's. 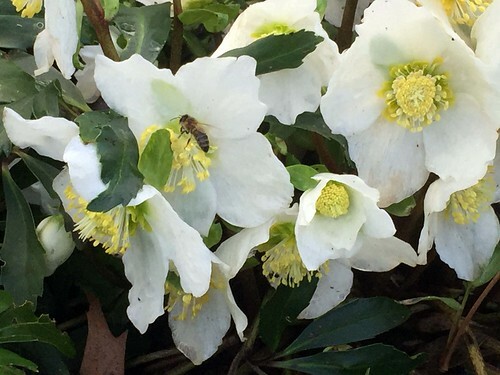 This hellebore plant had several bees on it even though it was nearing sunset, 4 pm, when I checked it.